1. Save your organic trash! Don’t throw away your kitchen scraps — add them to the compost pile. Kitchen scraps are typically high in nitrogen, which helps heat up the compost pile and speeds up the composting process. Egg shells, coffee grounds, fruit and vegetable peels and scraps are all outstanding materials to add. The one thing to watch out for is anything with meat, grease, or animal byproducts – these can attract some dangerous predators and pests to your compost pile, so it’s best to avoid using them. If you’re composting with a compost pile, bigger is often better. Heat builds up with a big pile, and the hotter a pile gets the faster it works. You don’t want to get much bigger than about 3 feet by 3 feet though – anything bigger than that is just too difficult to aerate and monitor. Photo courtesy of cicadas at Flickr.com. 3. Keep your compost aerated! If you’re composting with a tumbling composter, make sure you turn it whenever you add new materials. If you are composting with a pile, or in a static (non-tumbling) compost bin, be sure to mix up the contents so that the pile gets oxygen and can break down effectively. If you don’t have a tumbling composter, you can get some of the same results with a compost aerating tool. 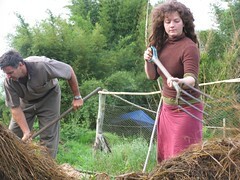 A compost pile needs moisture to keep the composting process active. Water is essential to the life processes of bacteria, and many of the helpful critters go dormant or die without water. Adding occasional moist material (ie; vegetable scraps or lawn clippings) should provide enough water to keep the bacteria churning away. 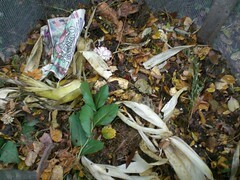 Don’t keep your compost too wet or it will get soggy and start to stink. Excess water starves aerobic bacteria of the oxygen they need to do their best work. Extremes of moisture (either too dry and too wet) should be avoided. Photo courtesy of Knile at Flickr.com. Too much of any one material will slow down the composting process. If you have all leaves, all grass clippings or an overload of any other single type of material, it can throw off the balance of the pile. In general, it’s good to keep a mix of green and brown material. For more tips and information on composting, visit the Compost Guide site.